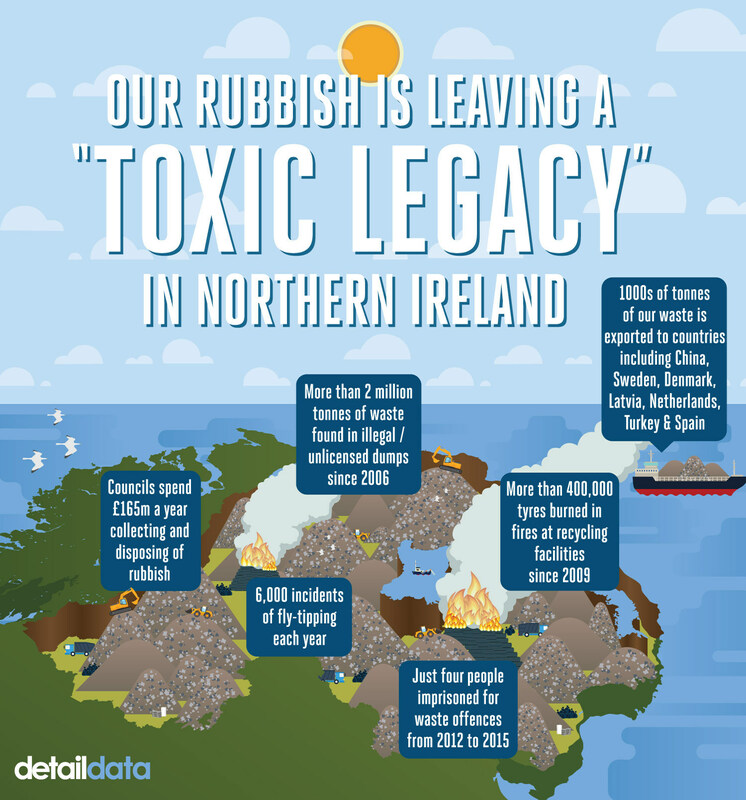 NORTHERN Ireland is producing more than two million tonnes of waste each year, with campaigners claiming that inadequate government policies could create a toxic legacy for future generations. Detail Data today reports on how Stormont is struggling to cope with the discovery of more than two million tonnes of illegally dumped waste in the past decade, nearly 6,000 incidents of fly-tipping a year, plus the burning of nearly 400,000 tyres in fires at recycling plants since 2009. Legally processing waste also comes with a huge cost. Each year councils spend more than £165million of public money collecting and disposing of nearly one million tonnes of rubbish, including £40million on litter alone. The Department of Agriculture, Environment and Rural Affairs (DAERA) said the amount of waste from other sources – such as industry, commerce and construction - is ‘greater’ again. Despite more than a decade of initiatives encouraging business and the public to reduce the level of waste produced, the amount is not falling, with the way we dispose of it also presenting problems. Rather than having sufficient facilities to fully treat it at home, Northern Ireland ships hundreds of thousands of tonnes of waste around the globe to be incinerated or recycled in a string of countries including Sweden, Spain, Turkey, Latvia and China. This has prompted calls for greater government investment in the local recycling industry, with a 2015 report by the Queen’s University based Resource Innovation Network for European Waste suggesting that such investment could create more than 13,000 jobs. In addition to challenges relating to legal waste treatment, Detail Data has learned of dozens of illegal dumps which together contain more than two million tonnes of waste. “To clean up these (illegal) sites could potentially bankrupt Northern Ireland, but not cleaning up these sites leaves a toxic legacy and we cannot pass on this toxic legacy to future generations," he said. Environmentalists and academics today urge Stormont to deliver on a public inquiry into illegal dumping that was agreed by the Assembly in 2014. They also call for a government rethink on the creation of an independent Environmental Protection Agency, which despite expert recommendations, was rejected by First Minister Arlene Foster when she was Environment Minister in 2008. Despite this consistent position by government, which today highlights its efforts to tackle environmental crime, campaigners contend that current structures are not fit for purpose with penalties deemed too low to act as effective deterrents. In the past three years (2012 to 2015) a total of 177 cases have come before the courts in relation to waste related crimes, with just four defendants being imprisoned. In its response, the Department for Agriculture, Environment and Rural Affairs (DAERA) said considerable progress has been made. “Policies such as increased landfill tax mean that we have reduced the amount of municipal waste going to landfill from 66% to just over 40% since 2010,” a spokesperson said. “Over the last decade the amount of waste recycled by local authorities has doubled and now accounts for over 40% of municipal waste. “Between 2010 and 2016 the Department’s Rethink Waste Capital Fund provided over £14million in funding assistance to local councils for recycling infrastructure and services. The department added: “Significant investment goes into the area of environmental compliance and enforcement. “Within DAERA, the Environmental Crime Unit has an annual budget of £1.6million and is tackling the most significant environmental crime. The unit works closely with local communities and the relevant agencies to secure convictions against those who destroy our environment through illegal disposal of waste. Councils spend £165million each year collecting and disposing of one million tonnes of waste. The amount generated from industry, commerce and construction is ‘greater again’. Nearly 6,000 incidents of fly-tipping were recorded in 2014/15. Thousands of tonnes of waste is exported from Northern Ireland across the globe each year for recycling or incineration to countries including China, Latvia, Turkey, Sweden, Denmark, Spain, Norway and The Netherlands. More than two million tonnes of waste has been found in illegal or unauthorised dumps in the last decade. Government confirmed the location of 66 illegal sites, which would cost £22.3million to clean. More than 30 other sites are also being investigated with the estimated cost to the economy running into hundreds of millions of pounds. More than 3.5million tonnes of waste has been legally landfilled since 2009. Nearly 400,000 tyres burned in fires at recycling facilities between 2009 and 2015. 177 people were convicted of waste offences between 2012 and 2015. Just four were imprisoned. Despite years of initiatives encouraging society to reduce the amount of rubbish it produces, council waste collections continue to total nearly one million tonnes per year – a figure similar to the one in 2002. The figures do not include non council collected waste (eg industry, commercial etc), which DAERA states are ‘greater’ than the council figures. While increased quantities of waste are often viewed as an inevitable by-product of economic growth, James Orr of Friends of the Earth believes that there has been too little focus on reducing the tonnage we produce. “The fact remains that the amount of waste generated by society and industry in Northern Ireland is not diminishing,” he said. In response, a DAERA spokesperson said: “The best way to deal with our waste is not to create it in the first place. A good example of how the Executive has helped to promote waste prevention is the introduction of the carrier bag levy. DAERA figures indicate that that the level of recycling of council collected waste has increased dramatically, from less than 9% in 2002 to around 42% in 2015/16. However, thousands of tonnes of this waste is exported to destinations including China (paper, cardboard), Norway (paper), the Netherlands (paper, plastics, aluminium cans), Turkey (hard plastics, scrap metals) and Latvia (aluminium cans) rather than being treated closer to home. Hand tools and textiles from some council areas were also transferred to Africa for reuse. According to environmental law expert Dr Ciara Brennan from Newcastle University this is for financial and practical reasons. "Reprocessing and recycling facilities for dealing with certain types of waste may not exist in every locality, especially in a small jurisdiction such as Northern Ireland," she said. “Put simply it is often cheaper to export waste than to put it in landfill due to increasing landfill tax costs and pressure to meet landfill and recycling targets." In addition to export for recycling, last year 150,000 tonnes of waste was exported to destinations including Spain, Sweden, Denmark and the Republic of Ireland for incineration. This process, where non-recyclable waste is burned to produce energy, does not currently take place in Northern Ireland. When asked for its position on incineration DAERA said: “Not everything can be recycled, but useful energy can be derived from waste that is left over. The Planning Appeals Commission is currently considering an appeal on a proposed waste treatment facility (including incineration) at Hightown, north Belfast. Responsibility for a decision on the issue is then expected to be made by the Department for Infrastructure. James Orr believes exporting waste that could be recycled closer to home is contrary to the spirit of recycling for ethical and economic reasons, while incineration should be viewed less favourably. “We can’t continue to ship our waste across the world. We can’t continue to call incineration renewable energy. It is not,” he said. “We aren’t just throwing away our waste in a very illogical manner across the world, but we are also throwing away the potential for jobs and economic stimulation. “We talk a lot in contemporary economic language about the circular economy, about resource management and about efficiencies of scale. A 2015 report by the Resource Innovation Network for European Waste stated that development of the circular economy in Northern Ireland had the potential to create more than 13,000 jobs. In response, DAERA said it was investing in the development of better recycling facilities. “We need to consider how adopting a ‘circular’ approach to waste management can benefit our economy and help us to achieve the Programme of Government outcome of living and working sustainably while protecting the environment,” a spokesperson said. “Between 2010 and 2016 the Department’s Rethink Waste Capital Fund provided over £14m in funding assistance to local councils for recycling infrastructure and services. In addition to challenges posed by the legal disposal of waste, illegal disposal presents an expensive and environmentally damaging problem. Perhaps the first visible indication of this is litter, which according to Ian Humphreys of Keep Northern Ireland Beautiful (KNIB) costs £80million a year. “We have a £40million street cleansing bill, which as ratepayers we are covering each year,” he said. As a result of the success of the carrier bag levy, which will be reviewed by April 2017, there has been increasing speculation that a charge could be imposed on other problem products such as coffee cups, plastic bottles, drinks cans and cigarette packaging. While acknowledging the potential of further levies, Mr Humphreys believes Stormont should take a broader approach. “That levy has worked very well in reducing the number of plastic bags in use, reducing the amount appearing in litter and funding far more proactive activities from the environmental charity sector. “I think while levies will work for individual items, they are not going to change littering behaviour and we need to change individual behaviour. To do this, Mr Humphreys wants to see the development of a litter strategy which would tackle education, enforcement and empowerment. “It has to pull together the best data and science available to ensure that any money invested gets the best results,” he said. “The content of the strategy should put pressure on people who litter. People should start to understand that there is a real chance they will end up with an £80 fine and if they are caught twice by the same council they will end up with a criminal conviction. In 2014/15 a total of 4,500 fixed penalty notices were issued, a figure DAERA say is a 33% increase on the previous 12 month period. Last year councils tackled nearly 6,000 incidents of fly-tipping, where waste was deposited onto land which had no licence to accept it. The council data, released under the Freedom of Information act, confirmed that fly-tipped material included household, building and farming waste, domestic appliances, car parts, furniture, bottles and toys. In addition to council expenditure dealing with fly-tipping, the Northern Ireland Environment Agency spent £1.3million clearing 600 fly-tipping incidents between 2012 and 2015. Many of these incidents related to fuel laundering. The Detail previously reported on the issue of dumping relating to fuel laundering, with nearly £1million spent clearing more than 2,500tonnes of related waste between June 2012 and October 2014. If littering and fly-tipping represent failings at an individual or relatively low-level scale, the prevalence of illegal and unlicensed landfill sites represent a much greater threat to the economy and environment. Detail Data has learned that in the past decade, more than two million tonnes of waste has been found in illegal or unapproved landfills – this in addition to more than 3.5million tonnes of council collected waste that has been legally landfilled since 2009. In response to a Freedom of Information request, DAERA confirmed the location of 66 dumps deemed illegal between 2006 and 2015. These dumps contained more than 724,000 tonnes of waste including construction, plastics, compost, commercial, domestic, asbestos, municipal, wood, metals, hazardous oils and cross-border waste. An arrangement exists whereby cross-border waste, found in illegal dumps, is repatriated to the Republic for disposal. DAERA estimate total disposal costs for these 66 sites is more than £22.3million. Additional costs to society from the sites include the evasion of landfill tax, which currently stands at nearly £85 a tonne. However, the total cost of illegal dumping is understood to run in to hundreds of millions of pounds with DAERA confirming that investigations are ongoing into a number of other sites. These ongoing investigations include the Mobuoy Road dump in Derry/Londonderry which is believed to contain over 1.5million tonnes of waste. In March 2014 the Assembly voted in favour of a public inquiry into illegal dumping. In June 2016 DAERA Minister Michelle McIveen said she would await the outcome of investigations into the Mobuoy site before making a decision on the inquiry. When asked about the issue by Detail Data ahead of the publication of this report, the Department declined to comment. James Orr of Friends of the Earth said without the inquiry there is no way of knowing the full scale of the problem. “The illegal dumping problem is widescale, it is persistent and it is of a monumental scale,” he said. “The biggest problem we have is not the sites we know of, but the range of sites we simply have no information on. “So the first stage in the process of dealing with this is to get a baseline as to the level and distribution of where these illegal sites are. Among the items that cause most concern in the waste chain are tyres. In addition to criticism that hundreds of tyres are dumped and burned on bonfires each year, Detail Data has learned through a Freedom of Information request that between August 2009 and March 2016 more than 400,000 tyres burned in fires at recycling facilities. In total, 26 fires were recorded at recycling facilities during the period, with thousands of tonnes of mixed waste also burned. The Northern Ireland Fire and Rescue Service said that tackling the blazes cost £365,000. In response DAERA said, “The review of waste management licensing exemptions, for example, should help reduce the potential for serious fires at recycling facilities by reducing the allowable quantities of waste materials able to be stored at a site. “In addition, the Northern Ireland Environment Agency, as part of DAERA, is reviewing waste management licence sites with regard to fire prevention plans." Analysis of court data provided to Detail Data under Freedom of Information legislation reveals that 148 defendants faced a combined total of 293 waste related charges in magistrates’ courts between 2012 and 2015. This resulted in 240 monetary penalties and 28 suspended sentences. In the crown court during the same four year period 29 defendants faced 98 waste related charges. This resulted in 44 monetary penalties, 34 suspended sentences and four cases of imprisonment/detention. According to Dr Ciara Brennan, illegal waste disposal continues because the potential penalties fall well short of potential gains. "Cases often don’t come before the courts – so for various reasons, people who should be prosecuted aren’t being prosecuted,” she said. "Then when the cases do get to the courts and a conviction is imposed, that doesn’t mean that the sentence will act as a deterrent to further environmental crime. “There are signs that both of these issues are being addressed, but much remains to be done in order to create a meaningful deterrent to the commission of waste crime. “There needs to be a robust and credible environmental regulator. This should be a body at arms-length from central government and ideally an Independent Environmental Protection Agency established as a non-departmental public body. In 2008 the then Minister for Environment Arlene Foster (DUP) told the Assembly that she would not be establishing such a body. The establishment of an independent body was supported by Mark H Durkan (SDLP) who held the Environmental ministry between 2013 and 2016. However, in May 2016 new Minister for Agriculture, Environment and Rural Affairs Michelle McIlveen (DUP) said she will not be launching such a body. In response to criticism of its performance in handling waste crime, a DAERA spokesperson said: “NIEA’s Environmental Crime Unit has a comprehensive strategy to deal with environmental crime, concentrating its resources on serious and organised criminal activity. “This is based on a partnership approach with other bodies such as PSNI, HMRC and other enforcement agencies. “It can involve working through cross departmental agencies such as the Organised Crime Task Force and covers areas such as crime which crosses the border. “Significant investment goes into the area of environmental compliance and enforcement. Within DAERA , the Environmental Crime Unit has an annual budget of £1.6million and is tackling the most significant environmental crime. “The unit works closely with local communities and the relevant agencies to secure convictions against those who destroy our environment through illegal disposal of waste. On October 18 the Department advertised the post of Head of Criminal Investigations for the Environmental Crime Unit. To view the data used in this story, click here.